Looking to make the perfect gift for a family you love? 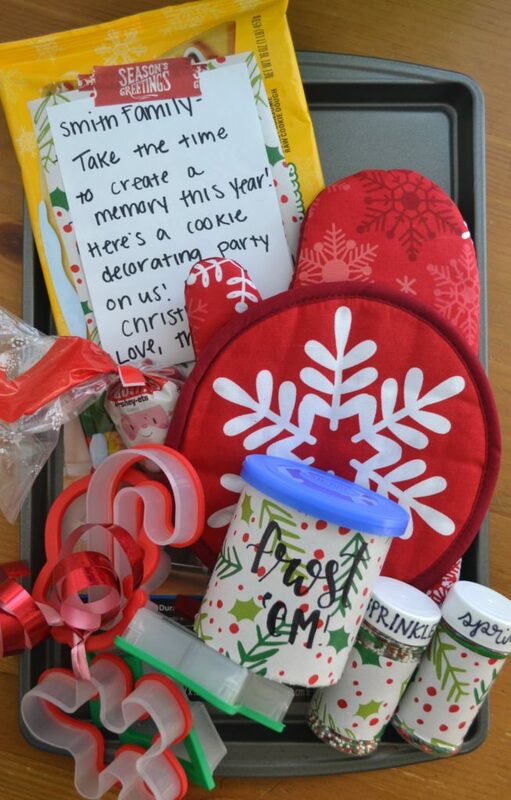 Give them the gift of family togetherness and creating memories by putting together this DIY Holiday Baking Gift. 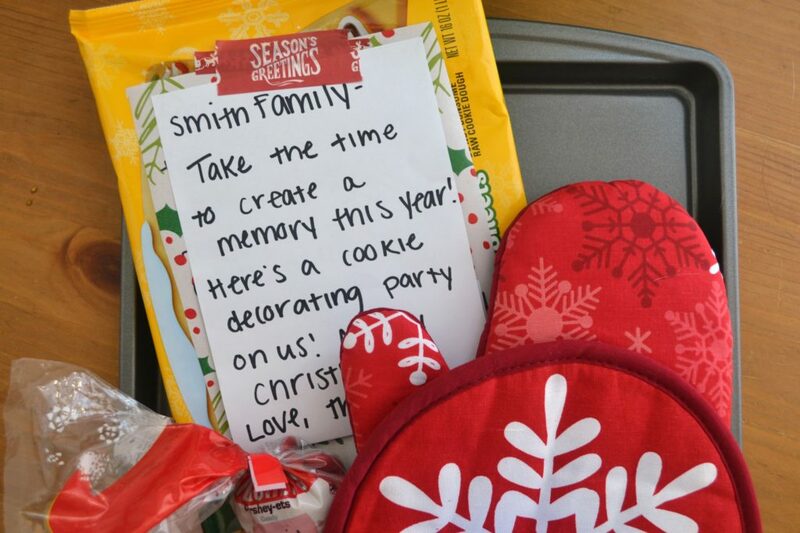 Supply them with all of the necessities for a cookie party and they can do the fun part as a family! If you’re anything like me, the holidays of your youth revolved around food. Each memory of childhood holidays is attached to a specific taste – snowman pancakes Christmas morning, eggnog as an evening treat, a stocking stuffed to the brim with my favorite peanut butter cup trees, and of course, heaps of homemade Christmas cookies. One of my favorite memories of the holidays is baking with my mom. We’d scour cookbooks for days deciding which ones to make, (or on the years that we were busier, the grocery aisles looking for pre-made dough) head to the store with an excessively long list, and get all of the ingredients required to make enough for an army. Some years we would space out our baking over a few days, maybe a weekend or two, while others our oven would warm the house all day long, usually a large pot of soup simmering as well to ensure we weren’t eating just sugar, butter, and flour. When all was said and done, we would package them all up into containers, keeping some and wrapping others in ribbon to give as gifts. Of the holiday traditions I can’t wait to continue with my boys, this is one I look most forward to. It wasn’t even until I got older that i realized that not everyone did this. This DIY Holiday Baking Gift is the perfect gift for a family that you love. Yes, it’s the gift of deliciousness and junk food, but it’s also the gift of family time. In a world of cellphones, social media, and crazy schedules, I really can’t think of a better gift. Cookie dough -I used the pre-rolled, refrigerated kind. Obviously, this is a pretty simple gift. There are a few different ways to package and gift it, but here’s what I did. Remove the cookie cutters from whatever packaging they’re in and tie with ribbon. 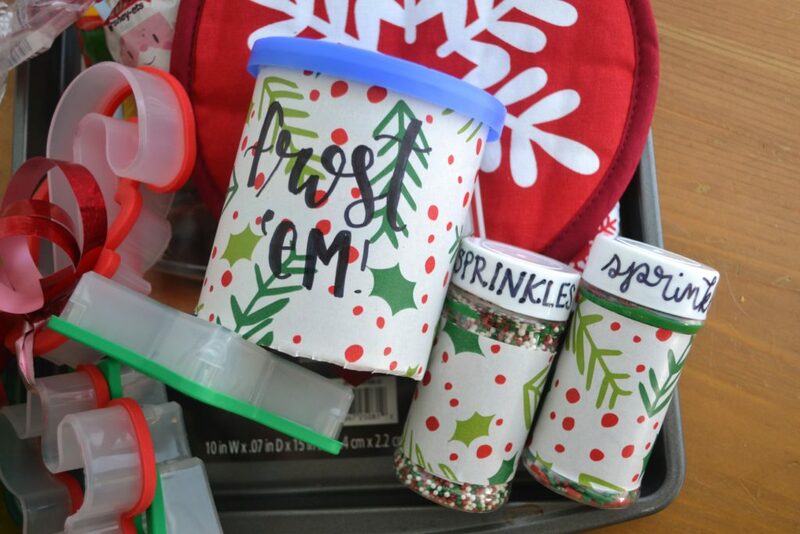 Using festive wrapping paper (or creating a printed label online), I cut and glued a strip to things with a label and labeled them myself, like the frosting and sprinkles. I think these small steps just add a little bit of extra thought to a very simple gift, but it’s totally not necessary. On the rolled out dough, I cut a small square and used festive washi tape to tape on a sweet note explaining the gift. Layer all of your items on top of your cookie sheet and wrap together if desired. You could easily keep it all together by using a clear cellophane bag they use for gift baskets, but I couldn’t for the life of me find one, ha! Instead, I just taped everything into place. Alternatively, place everything into a gift bag and deliver it that way. Don’t forget to include a set of Rubbermaid TakeAlongs for the leftovers! 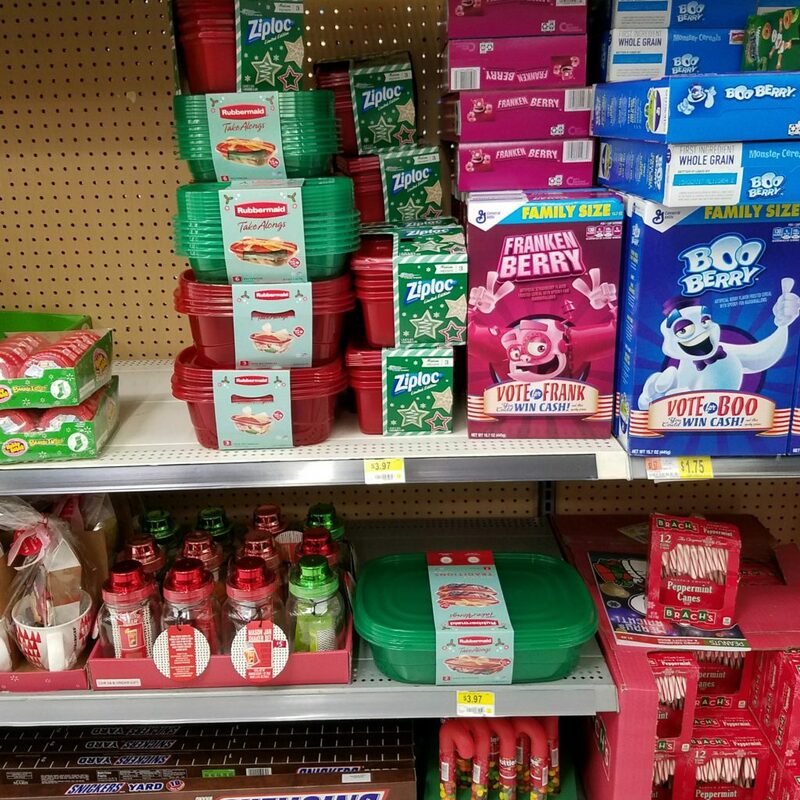 These festive containers are the perfect place to house all of the perfectly decorated treats – and hey, maybe they’ll even return the favor and gift you a few! 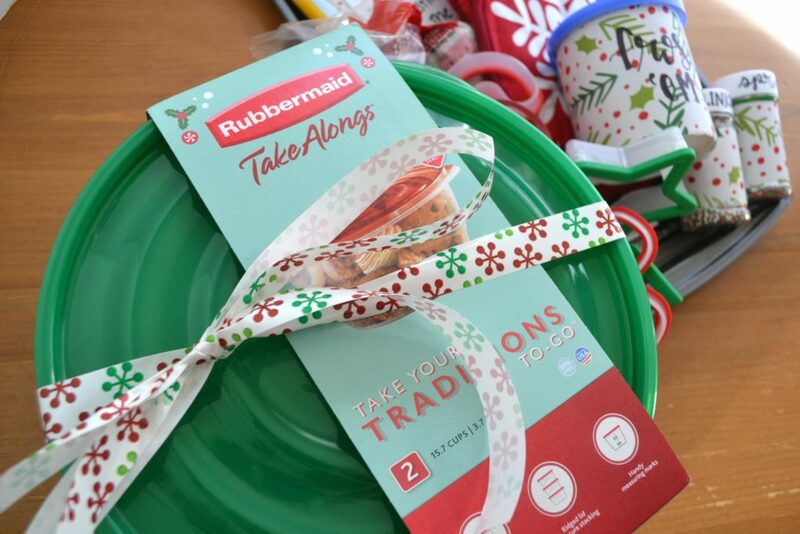 Rubbermaid TakeAlongs come in limited edition red, green and prints for the holidays, which makes them the perfect addition to a holiday gift and are available in store from now through December 24th. 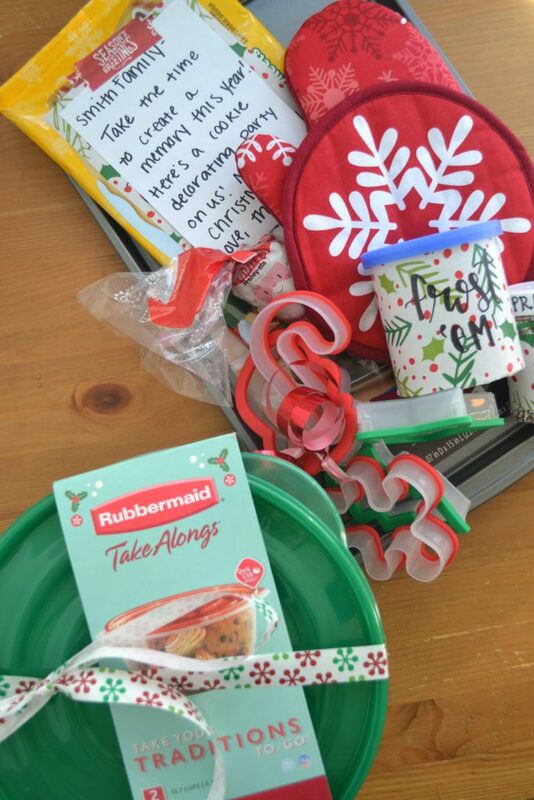 I found my Rubbermaid TakeAlongs (and all of the parts of this gift) at my local Walmart in the Holiday baking section. I love that they are dishwasher, freezer, and microwave safe, so I know that whoever receives them will be able o use them for more than just cookies. The soft, flexible lid holds tight to the container to help prevent spills, but the large tab makes it easy for even the smallest cookie thief to open. This gift is super flexible – feel free to make your own cookie dough, gift one of those adorable cookie dough jars, or bake the cookie ahead of time. You could make frosting, gift extra tubs of pre-made frosting along with food coloring, or add in a few tubes of colored, squeezable decorating frosting. Add in a mixing bowl, a rubber spatula, measuring spoons and cups, and your favorite cookie recipe. This DIY holiday baking gift can be extravagant or very simple, which is why I love it. So tell me – do you enjoy baking around the holidays? What are some of your favorite holiday memories? Would you enjoy receiving this gift? Let me know in the comments! 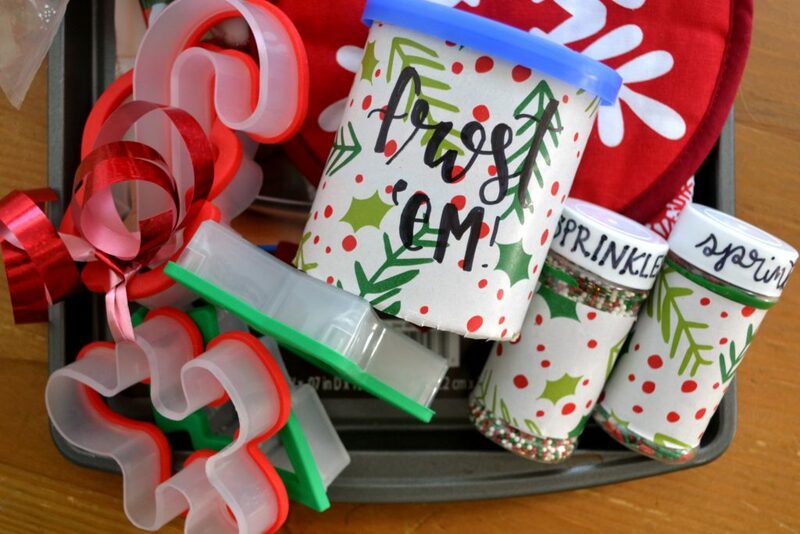 For more holiday inspiration, be sure to head over to sharetheholiday.com ad well as the Rubbermaid Facebook and Instagram! This is a cute idea! Every year, my family and I get together either black Friday or the Saturday after Thanksgiving to bake Christmas cookies together–its our way of kicking off the Christmas season. I love this idea. 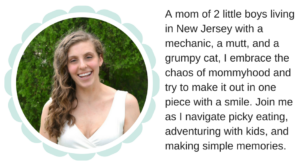 It’s definitely a gift you can keep simple or make more elaborate, like you said, which is great because it works for everyone. I loved baking cookies with my mom and sister growing up and I’ll be hosting my own cookie exchange party in a week so I love this. This is super cute and easy. I love how you wrapped the frosting and sprinkles. Little touches like that make it so fun. That’s a great idea and a nice alternative to just bringing over the 1,089 plate of cookies of the season. They could at least have fun decorating them as a family. What a wonderful gift idea for a family! I love the thought of gifting an “experience”. This is a nice gift idea! Kids love decorating cookies. What a lovely gift idea, Morgan! Pinned, and have scheduled a tweet later. This is such a thoughtful idea for a holiday or hostess gift. Thank you for sharing with us at Hearth and Soul. Hope to ‘see’ you again this week! Such a cute idea! So simple and thoughtful.